This controls the backscroll size of the event-log in the 'Home' view. Setting this to a higher number will allow the user to look further back into the event history, but may consume more RAM and CPU. It is recommended that the backscroll size not be increased unless it is understood that this may have an impact on performance and memory usage. Setting the detail level too high may also cause high CPU usage in some situations. Pressing the 'Reset All' button will force all transfers to reset to the default detail/size, even if they had custom levels set. The "Log detailed tracker messages" option will log the exact request and response string used when communicating with trackers. 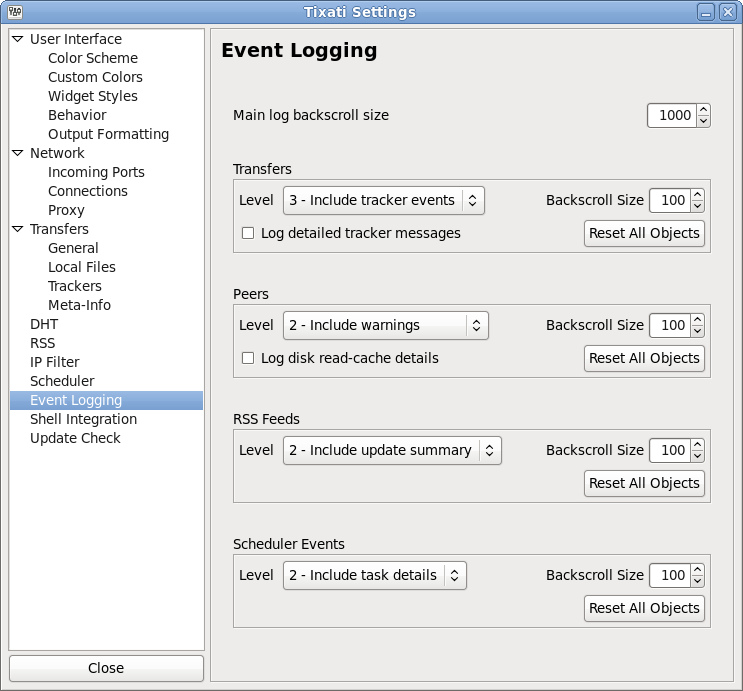 This is the same as the transfer log settings, except that it is even more important to be careful with detail level and backscroll size due to the fact that there are more peers, and the higher detail levels will log individual messages, which may consume large amounts of CPU time, particularly with high-bandwidth peers. Because RSS events are somewhat rare and sporadic, setting the detail level higher will not impact performance. However, setting the backscroll size to a very large number will consume more RAM if you have a large number of feeds. Scheduler tasks typically don't produce many events in the log, so using the higher detail level will not impact performance, but may make the log more difficult to read if you have a large number of transfers or feeds that are affected by the tasks.